Ultra primes were the first of the current production Zeiss cine primes to be introduced, becoming available in May 1999. They are still in production and have become a mainstay of high end cinematography. The traditional helical thread based focus system, used on the Standard and High Speed Primes, moves all the optics and most of the lens housing with focus (the length of the lens changes during focus). 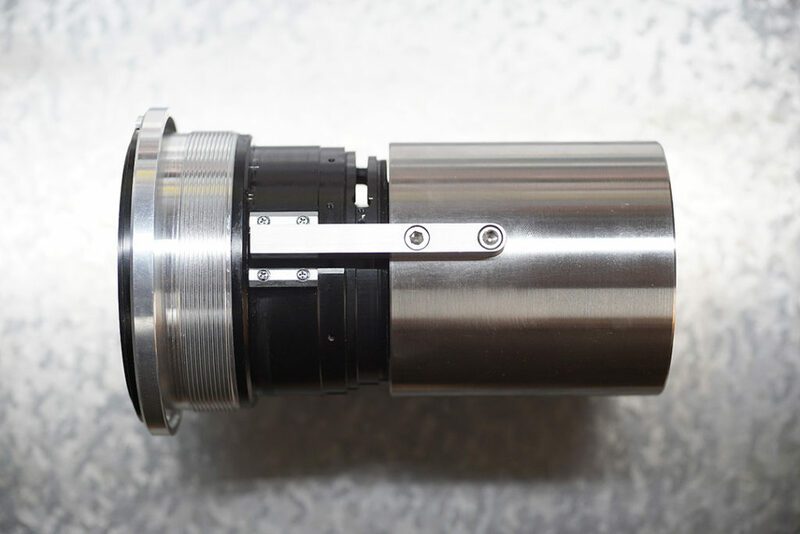 The weight of the optical housing had to be supported by the fine-pitch helical focus threads. This focus system was subject to wear over time and weight on the front ring (clip-on matte box) would accelerate the process. It was also a somewhat delicate system to service. The length of the various lenses in a set varied, sometimes considerably as in the case of the Standard Primes T2.1 Although the position of the focus gears was consistent on most of the focal lengths, the iris gears, which set ahead of the focus gears, had significant variation in their position and they also moved away from the lens mount as the lens was focused on closer distances. Focus scales had small distance marks that were not as easy to the read as the marks on other modern lenses (Cooke S4, Panavision). The focus scales had feet and meters on one scale2, leading to a visually “busy” design that could be confusing under the stress of production work. The Standard Primes set had many focal lengths, but it was a combination of new and old designs, so differences in sharpness and color rendition were noticeable when going from an old design (Distagon 2/24) to a new one (Distagon 2/28). A completely new mechanical design where the main barrel spanned the distance from the lens mount to the front ring as one piece, and the entire optical system was isolated within. Any forces the lens was subject to, like pressure on the front ring from a clip-on matte box, or torque on the focus gear ring, would be transferred directly the mount without affecting the optical components. Internal focus system for all focal lengths: On all Ultra Prime lenses, the length of the external housing remains constant during focus. The positions of the focus and iris gears are unaffected. The Distagon lenses (all lenses in the set shorter than 50mm) use a floating element system where the front group stayed in a fixed position and only the rear group moved during focus. This system reduces field curvature and aberrations at shorter focus distances, where the lens is used most of the time. This is in contrast to older lens designs that were optimized for infinity focus. The Planar lenses, use a semi-floating element system utilizing unit focus with a fixed rear element (similar to the Planar 1.2/50 and 1.2/85 High Speed primes). Entirely new optical designs, achieving a consistent T1.9 aperture for all lenses in the set except for Distagons 8R, 10 and 12mm. The new optical designs eliminated glass types that contained lead or arsenic. This anticipated the EU RoHS directive, and the Ultra Primes were able to stay in production after 2004 unlike the High Speed primes which had to be discontinued. New advancements in anti-reflective coatings and anti-reflex paint to suppress stray light within the lens resulting in increased contrast and color purity. All lenses in the Ultra Prime set are held to the standard of delivering over 90% MTF at 10 lp/mm. This high contrast at low frequency is perceived as the “crispness” of the image. The Ultra Primes were the first cine prime set from Carl Zeiss to be “Super Color Matched”. The Color Contribution Index of the entire Ultra Prime set is held to a very narrow tolerance. Improved optical performance in close-focus (traditional lens designs had been optimized for infinity focus). The irises have nine blades (10 in the case of the 135mm UP). For comparison the High Speed (Super Speed) 35mm format primes had seven iris blades. The first Ultra Primes were available starting May 1999. A 65mm focal length was added in May 2001, and 12mm and 180mm focal lengths by December 2001. Ultra Primes have been in continuous production since 1999. 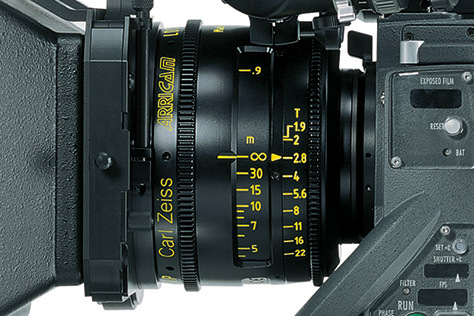 Zeiss Ultra Primes are an ARRI/Zeiss product and are available exclusively worldwide through authorized ARRI dealers. *The Ultra Prime 8R has been discontinued. All other focal lengths remain available. Above: Size comparison of the Ultra Prime set. All lenses shown at the same scale. Ultra Prime images courtesy ARRI. Ultra Primes are known for their excellent optical performance. The set is characterized by it’s consistency, with no “weak” focal lengths, and for its optimization. Compared to previous lens designs, Ultra Primes preform very well wide open and require minimal stopping down to reach the aperture for optimum MTF. Distortion is very low even on the widest focal lengths. Field curvature is well controlled. Ultra Primes are known to be the most reliable Zeiss cine primes in service. Their mechanical design is robust and the focus mechanism not subject to wear as the Standard and High Speed primes were. Image shift and backlash during focus are rare and usually indicates a mis-adjustment in the focus system. All focal lengths have at least one optical centering adjustment. Field curvature and spherical aberration are also adjustable. 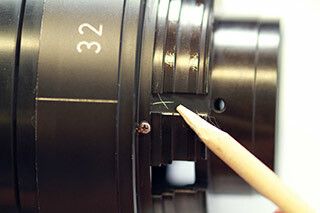 CinemaTechnic is equipped with all the special tools and experience to service Ultra Primes. 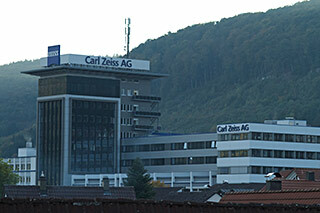 Master lens technician Jorge Diaz-Amador has been certified by Carl Zeiss for Ultra Prime service since 2004. Calibrating the critical parallelism of the slide-way guides, using a tool custom-made by CinemaTechnic to Carl Zeiss specifications. Ultra Prime 14mm disassembled. 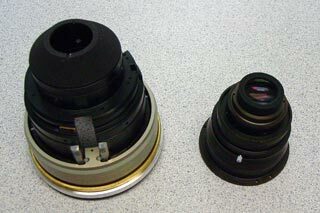 Mechanical housing on left, rear optical housing on right. A version of the Ultra Primes incorporating the ARRI Lens Data System (LDS) was offered beginning in late 2001 in conjunction with the introduction of the ARRICAM Super 35mm cameras. LDS Ultra Primes combine the optics, internal housing and focus mechanism of the Ultra Primes with a new outer housing and LDS electronics made by ARRI Vienna. The entire outer housing, focus scale, iris scale and PL mount are different from the original Ultra Primes. Zeiss also produced a series of lenses that share the Ultra Prime mechanics, but have completely different optics designed to cover the Super 16mm format, and have a T1.3 aperture. These lenses were designed to provide the highest optical quality in the Super 16mm image area. The optical design of these lenses is superb, even by Carl Zeiss standards. They are the sharpest cine lenses so far produced (within their image coverage circle). Due to unfortunate timing (just in time for RED killing interest in the S16mm format), production of these lenses was very limited. It is not known how many Ultra 16 sets were produced. In over 5 years working at a Carl Zeiss authorized service center, I never had a single Ultra 16 lens come in for service. This is unfortunate as we had all the special tools for them, and I would have been quite keen to do optical testing on them. The author (seated right in green shirt) during his first Ultra Primes service training at Carl Zeiss Oberkochen in May 2004. 1 The Distagon 2/10 Ultra Prime uses the same optical design as the Distagon 2/10 Standard Prime and the mechanics are also nearly identical. This lens was the most advanced in design of the Standard Primes so it was left mostly unchanged except for cosmetics. 2 The High Speed / Super Speed primes Mark III had single-standard scales, either feet or meters.